Well, this year’s Plan is actually WAY more laid-back and simple than that may sound. It’s my ninth consecutive year of full-time small-scale organic veggie farming, and this will be my FIFTH start-up on land that’s new to me (3 in the last 2 years, it’s been interesting times). At this point, I’m kinda used to it, and able to be real streamlined and minimal, economical and quite efficient. This year, I’m still planning to grow just about everything in the way of garden veggies that can possibly do well in our mid-May to mid-September average frost-free Zone 4 (US) climate, but I’m majorly adjusting the relative quantities, growing more of some crops, and way less of others. I’m also concentrating my seed purchases mostly with one main supplier, and more carefully considering the number and selection of varieties than ever before. Among other big but simple changes from the past. To underline the more-is-less point to myself, rather than starting as usual with a brand new planning notebook, I took my very first steno pad, from Year 1, way back in 2002-2003, ripped out all the used pages (saving them, of course, for the wayback machine), and began with a thin new no-waste Tiny Farm 2011 clean slate! Exciting! I’ve missed dispatches from the Tiny Farm up North. I’m readying for the thaw myself — though a backyard garden requires much less planning than a farm, to be sure. Neat to hear. I’m a big believer in ‘less is more’, and like your example and reference to your experience changing your needs. Your post couldn’t come soon enough! It’s nice to have you back — and with this nonstop snowfall we’re having in Massachusetts right now, I am ready to start dreaming of growing things again. 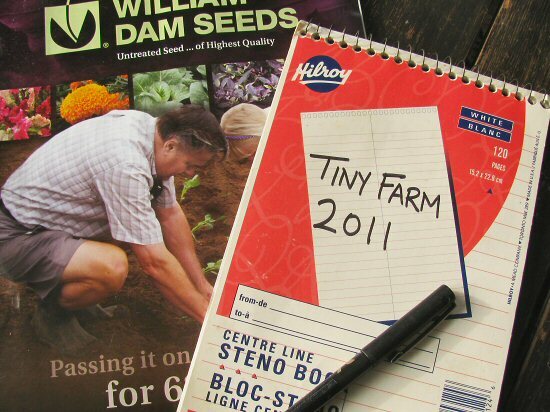 Knowing that in Tinyfarm-Land it’s time to start planning reminds me that there is an end in sight. Thank you. Good luck with a(nother) fresh start! Welcome back! (We we’re all wondering what happened to you :) Looking forward to your new season. Out of curiosity have you every tried growing quinoa? nice to hear from you mike! ordering seeds here too… it’s nice to finally start to see the light at the end of the winter tunnel. still in the area? we opened a green store in fenelon last summer, between the bank and the beach. drop on by if you’re ever in town. look forward to following your season – sending good growing vibes. cheerio! Please consider buying your fresh vegetable seeds for 2011 from The Galation Farm, at E-Bay. Online shopping and payment with Paypal, plus the time saving convenience of having your seeds delivered! Welcome back. Your blog is a small piece of good in a sometimes messy world. Honest, hopeful and inspiring. How did your sheep work out? Mine are set to start lambing in 3 or 4 days. All the very best to you in the coming year! Glad to see you back and getting ready. After years of family gardening, I’m finally farming for market this year to subsidize our dairy income. Your blog has been an inspiration and great guidance. Welcome back, Mike! I am so glad to get news from you. I was a little saddened by your silence this year, since your blog have been very inspirational to me. I am glad to hear you’re alive and kicking! Even moreso considering I GOT TINY FARMING PLAN OF MY OWN FOR 2011!!! Yep, I just moved in the country, where I bought a piece of land for myself. 2011 will be my first season as a commercial grower, albeit a nano-sized one with less than half an acre being grown this year. With almost 10 tillable acres, I got plenty of room to expand, but I am taking it easy for the first season. Plan is to experiment and refine my techniques for a couple years before I move from gentlemen to full-time farmer status. I, too, settled on buying most of my seeds from William Dam this year. My experience with them is that the seeds are indeed of very good quality, but they tend to take a long time to ship. To work around that, best is to place the order early (mine is done). I completed my selection with smaller order to Vesey’s and Johnny’s, and to a local artisan seed provider. In the future, I would like to source most of my open-pollinated seed varieties from local artisans (there’s many), and only order hybrid from the larger suppliers such as Dam. We’ll see, but for this year, I am trying to keep thing simple. Sadly Ireland’s farming future is one which will include GM crops, after the government does a u-turn on its policy. Hi there, I was wondering were you got the 3 column theme for your blog, I Have been looking for this style for a while, did you do modify it yourself or did you get it from someone, and would you be willing to share it? Sounds like a great start! Just found your blog and looking forward to following along! Hi! I’m new here and from a slightly warmer zone (6), but I am planning a micro-farm too! First year… kinda scary. But i’m trying all organic. I’ll be watching and learning all I can from your site! I cant wait for winter to be over as well and start sprouting some seeds! Small micro farms are fantastic and popping up everywhere which is great. Have a look at http://www.incredibleseeds.ca for high quality open pollinated seeds from a Canadian Company. Everything is shipped out within 2 days. I loved the more you know, the less you need principle you are using. I like your blog post entries. More power to your farming adventures. I absolutely love this blog, it’s inspiring to see practical and self sufficient ways of farming and growing food. I would love to own a farm – maybe one day lol – but at the minute you’ve motivated me to grow my own veg in my garden and although it’s still cold it’s going really well. I have saved so much money!! Thanks again – keep up the good work! Very cool. Any chance you could open up that notebook and share some secrets? I’d love to hear more details!